Let Children Explore Their World - Young children, in particular, explore their world using their senses. Provided it's safe, let the touch, smell, taste and see the world around them. If they pick apart a flower, let them so they can see what the inside of a flower looks like. If they spot an ant pile, watch it with them and explain how the ants all work together to live. Too often, we stop children from exploring. Let them go! Explore Science on Vacation - Many kids love nature and there are many ways to discuss science and nature together. Explore a beach at high and low tide and discuss what causes the tides. Look at the moon and talk about how the shape of the moon changes with the seasons. Watch the ocean waves crash against the rocks and discuss erosion through wind and water. Science Kits with Multiple Experiments - My favorites are the award-winning science kits by Steve Spangler. These science kits include multiple science experiments in one kit and come with instructions. The experiments range from simple to more complex. These are perfect for parents and kids getting ready for science fair projects! These kids science kits are also great for helping kids learn cause and effect, how to predict outcomes, form hypothesis, and practice communicating what they've learned. See our website, www.jumpstarttoys.com for these science kits. For one big bag of science, try the Big Bag of Science kit. Need snow in the desert or Southwest? 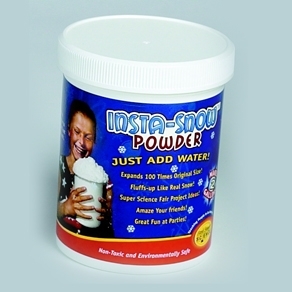 Try Insta-Snow, which makes snow by just adding water. Now that's simple chemistry! Look for Free Science Experiments on the Internet - The Internet is a great resource for science ideas and experiments. The National Science Teachers Association website has some great information as well as a list of awesome websites with age ranges so you can quickly and easily find sites with information and experiments that are age appropriate for your child. As a teacher I can easily recommend these science kits. The variety of activities in these kits are easily extended for deeper understanding depending on the child''s level of interest.